If you are looking to buy a new or used vehicle, you are probably wondering: How much car can I afford? The answer is complicated and different for everyone. Like most major financial decisions, you should not rush into deciding what type of vehicle you’re going to buy, and definitely shouldn’t buy a vehicle as an impulse purchase! If you remember nothing else, remember this: A car is a depreciating asset, and you don’t want to treat a depreciating asset like you would an investment. While you may feel a temporary boost in your self-esteem by purchasing a car that you can barely afford, you will come to regret it when you feel the financial impact of sinking money into it for years to come. If you speak to older friends or relatives who are financially savvy, they might mention the 20/4/10 rule. What is this rule, you ask? It’s pretty simple—and for most, pretty outdated. The 20/4/10 rule stipulates that you should make a downpayment of at least 20 percent of the vehicle’s price, find a loan that is no longer than 4 years (48 months), and make sure that the monthly amount you spend on your auto loan, maintenance, gas, and insurance is less than 10 percent of your gross income. The rule is simple—and if you’re a high-earner who just needs a simple vehicle, it’s definitely a good idea. For example, if you are a median income household, earning $59,000 a year, you should choose a vehicle that costs less than $492 per month total for insurance, maintenance, gas, and car loan payment —for no more than 4 years. If you have good credit, find a 4-year loan with 5 percent interest, you can probably afford a loan of around $15,000 total ($345 monthly loan payment) and still afford gas and insurance while staying in the rule’s 10 percent range. If you put 20 percent+ down, that means you can afford a vehicle with a sticker price of around $20,000, assuming you’ve saved the requisite $5,000. But what if your family needs two cars? Or what if your family earns less than $59,000? That’s where things get complicated and the rule doesn’t always work. In an ideal world, everyone would be able to afford a vehicle that meets this rule’s frugal requirements. But that’s not always the case, and so some creative thinking is generally required to figure out the realistic amount of vehicle you can afford. If you’re swamped with student loans, just purchased a house and have twins on the way, now is not a great time to buy a vehicle that is going to stretch your budget. But if you’re single, a high-earner, and are already saving 20 percent of your income, feel free to break the 10 percent rule for the car of your dreams—within reason. If it’s worth it to you and you can afford it, spending a little more on a car makes sense. But it isn’t smart to strain yourself. A car loses value from the moment you drive it off the lot, so you should really think about how important having an expensive vehicle is to you before you buy one. If you really really really love cars and aren’t worried about where you are going to sleep at night (or other expenses), go hog wild: it’s your money and you should spend it how you want to spend it. If you really only want a car because it’s the most efficient way to get from point A to point B, try to find a used car that comes as close to being under 10 percent of your annual income or less as you can. If need be, it’s better to go with a little bit longer loan term than to be in a frantic mood every month when the car payment is due. Remember, emergencies come up, and you want to be able to save for a rainy day and pay for your vehicle at the same time. Sure, having your own set of wheels is fun and exciting. But can you really afford it? You need to be honest with yourself for the sake of your financial future. Of course, in certain areas, having a car is a necessity. But in most cities (and increasingly many suburbs), it is a smarter financial move to get a bus pass or an unlimited subway ticket than to take on the financial responsibility that car ownership entails. 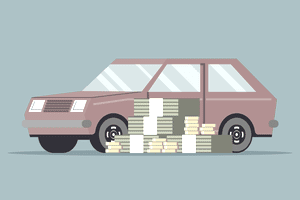 As you are trying to figure out how much car you can afford, you might be tempted to plug your savings and income into one of the many calculators on the web—but don’t do it! These calculators, often hosted by car insurance or auto loan companies, aren’t going to tell you the wise amount to spend: they’re going to show you the maximum amount you can spend—and you never want to be spending the amount that is going to max out your budget! You shouldn’t be asking how much car you can afford—you should be trying to find the best value vehicle that’s going to get you from point A to point B and doesn’t leave you strapped for cash every month.